Michael Pachter, financial analyst extraordinaire, stated that he believes Microsoft's Natal will outsell Sony's Motion Control, now called Arc, 5 to 1, or oven more. Michael Pachter is one opinionated analyst. The Wedbush Morgan Securities analyst is known for making bold statements like his belief that we've seen the last console generation or that the PSP Go was a "ripoff." He is now sounding off on the Motion Control Wars of 2010, saying that Natal has a distinct advantage over Sony's Arc because Microsoft's entry will ship "in the box." He sees Arc's reliance on the PlayStation Eye as the major factor in its slower adoption. "I think that the Sony motion controller will have some problems gaining traction, since it is not an 'in the box' solution. 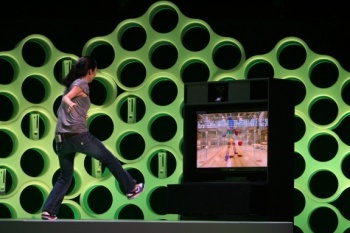 That will probably limit adoption to one or two million at the outset," Pachter told PS3Center.net. "Natal is different... It's only one piece, is likely to be cheaper, and I think it will come in the Xbox 360 package with new consoles once launched, meaning far deeper penetration." The bundle with consoles is going to be a huge selling point. Many consumers who might have resisted buying an Xbox 360, and gone with the cheaper Wii, might now think twice because they can get a more robust experience with Natal. But Pachter doesn't completely discount Sony. "Sony's internal development is top notch, so I expect the launch titles to be fun, and likely on par with Wii Sports for quality, but ultimately, I think that the motion controller will only sell to 20% or less of the PS3 audience, limiting it's appeal to third party publishers," said Pachter. "A year or so after launch, there will be 10 million [Project Natal units] out there, which will probably attract more third party support. Also, I think Microsoft will subsidize third party development to make it a success." So there you go, Pachter says that Arc will sell "one or two million at the outset" to Natal's 10 million. Pachter comes at the topic from an analyst's point of view. What do you think as a gamer? Will Natal or Arc be able to loosen Nintendo's kung-fu-grip on the industry?